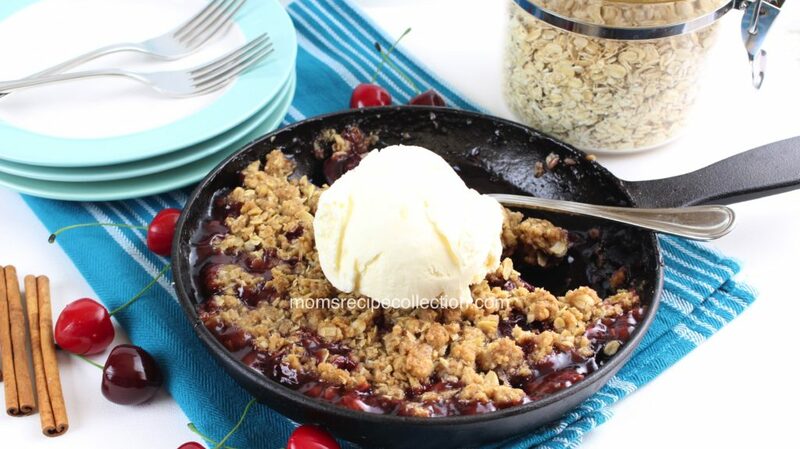 Nothing brings back memories of down-home cooking like this Cherry Crisp dessert recipe. This is one of those recipes that just brings a smile to your face once you smell the smells that are coming out of your oven. 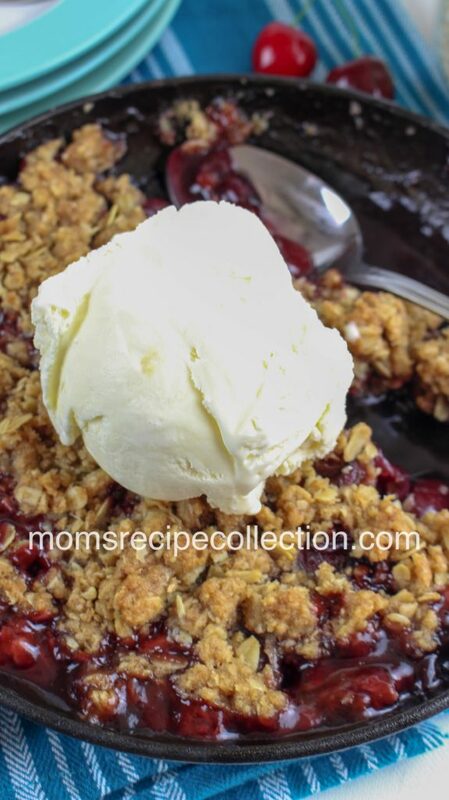 If you are looking for an amazing dessert that is certain to hit every taste bud in your mouth, this Cherry Crisp recipe will not disappoint! 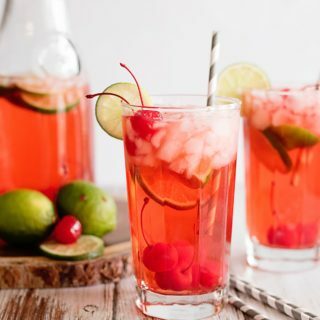 With cherries currently being in-season, the time is now to make this recipe! Baking a dessert with fresh fruit packed full of flavor is the only way to do this dish justice. The best part about this recipe? Eating it warm, straight from the oven. Make certain that you pair a large piece of this Cherry Crisp dessert with a heaping helping of ice cream to take it from good to great. The warm Cherry Crisp combined with the cold ice cream create a yummy melted effect that will have you scraping your plate to the very last bite. 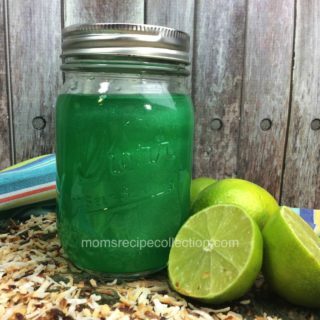 Have fun in the kitchen and let your little ones create this recipe with you! They’ll love following all the steps and measuring out all the ingredients as well! 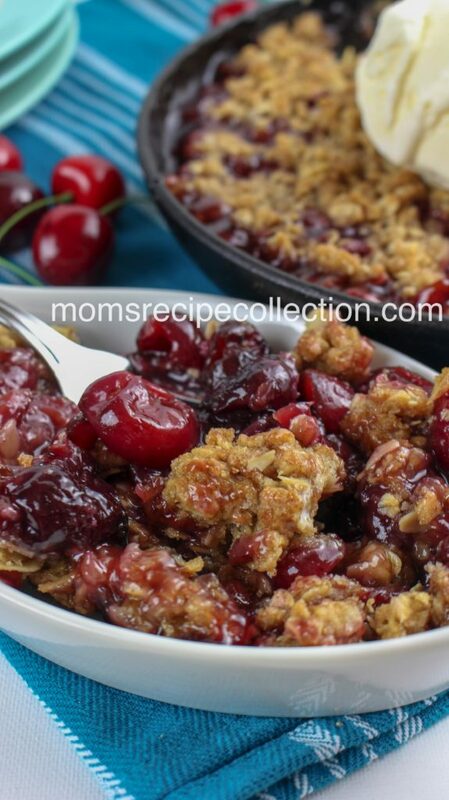 Next time you are craving something sweet, give this Cherry Crisp recipe a try! It’s delicious to the last bite! This homemade cherry crisp is the heartwarming, comforting dessert recipe you've been looking for! Preheat oven to 350°. Lightly grease a 8-10 inch skillet and set aside. In a medium mixing bowl, add the oatmeal, flour, 1/4 cup granulated sugar, brown sugar, cinnamon and salt. Stir well to incorporate. Add the cold and cubed butter to the oatmeal mixture. Using your hands, mix well until the topping resembles a crumbly mixture with small clumps through out. Place in refrigerator and chill for 20 minutes. In a large mixing bowl, add the pitted cherries and 1/4 cup granulated sugar. Toss lightly to coat. In a small bowl, combine the water and cornstarch and stir until thickened. Pour on top of the sugared cherries and stir gently. Spoon the cherry mixture into the bottom of the greased skillet and spread out evenly. Sprinkle the chilled oatmeal topping on top of the cherries, covering entirely. Sprinkle 1 tablespoon of granulated sugar on top of the crumbles. 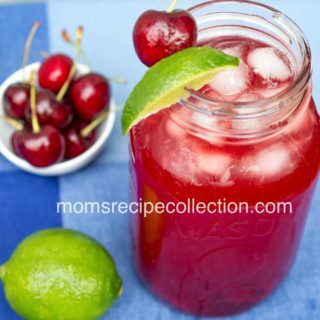 Bake for 30-35 minutes or until the crumbles are golden brown and the cherries are hot and bubbly. Best served warm with ice cream or a dollop of whipped topping. ENJOY!